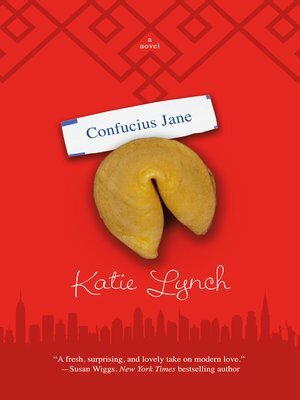 Confucius Jane by debut author Katie Lynch is a lush and charming novel that vividly depicts New York City's Chinatown while taking the reader on a touching journey of family, community, and love. On leave from college, Jane Morrow has a new job, helping out in her uncle's fortune cookie factory, and a new roommate—her precocious 11-year-old cousin. Though surrounded by her loving family and their close-knit Chinatown community, Jane feels like a colossal failure. Writing fortunes is a kind of poetry, but Jane is penning words of wisdom for strangers while wondering if she will ever have the guts to move on with her life. When Jane meets medical student Sutton St. James at her local noodle shop, sparks fly. Sutton stands at a career crossroads: surgical residency or stem cell research overseas? The first is what her father, former Surgeon General and "America's doctor," has planned for her, but the latter might help find a cure for her mother's debilitating MS. Neither would make either of them comfortable with their daughter's sexuality. Sutton's only certainty is that she has no time for a relationship—yet neither she nor Jane can deny the chemistry between them. Jane opens a whole new view of family to Sutton, a powerful counter to Sutton's cold, sterile upbringing. Sutton inspires Jane to be more ambitious and to dream again—and challenges her to have faith in herself. But can Sutton and Jane overcome a scandalous secret that threatens to keep them apart? Katie Lynch is the director of the MTS Honors Program at SUNY Rockland Community College, where she also teaches English. She lives with her wife, son, and dogs in New York City's West Village.